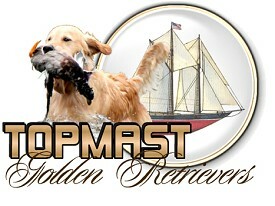 We are Golden Retriever owners with a limited but well-planned breeding program, done in close consultation with our dogs' breeder, Gayle Watkins, Gaylan's Goldens , NY. This means that each breeding is of tremendous importance to us and that we put all our efforts into caring for, socializing, and placing our pups. * A Canadian Champion and UKC Champion. * Three Master Hunters and one needing only a couple more passes for her MH, four Senior Hunters, and several Junior Hunters. Three dogs with their WCX and several with their WC. We have several that are now training for hunt tests, with at least one pup from each litter with a hunting title. * A MACH2, a MACH and several dogs with their MX or MXJ working towards their Master Agility Championship (MACH). * Dogs with their AX or AXJ, working on their MX & MXJ. * Ten dogs that have obtained their NAJ or NA and/or their OA or OAJ titles. 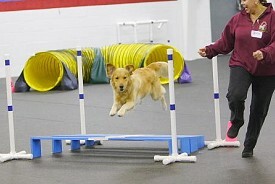 At least 17 dogs that are running in/or training in Agility. * Dogs competing in FAST, with two having their Master Excellent Fast titles. * A CT (Champion Tracker) Tracking dog who obtained her TD at the GRCA National Specialty and who recently passed her VST to complete her CT title, and our own Kerri, who is our first TD ever. * Three dogs with their UDX two with Obedience Master titles, another brand new UD, two with a CDX, and several with a CD working towards their CDX, and several working in obedience. * Twelve dogs with Rally titles, with several showing in Rally. * TWELVE dogs with their Certificates of Canine Good Citizenship (CGC), from AKC. 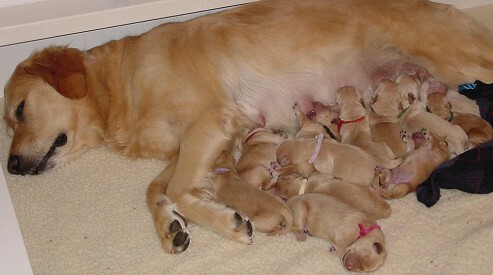 *SIX of the eleven Traveling litter had their CGC's by 9 months of age. * Three of the Traveling pups are active in Dock Diving, with one with her U-Junior Jumping (U-JJ) title. Two have their AKC Puppy Star Program certificates. 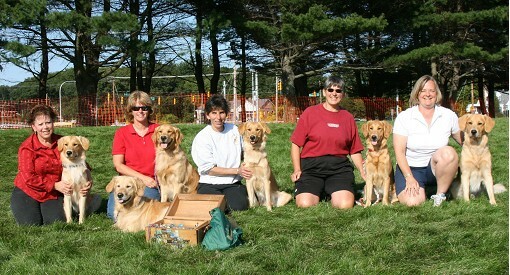 * Four Certified Therapy Dogs with several actively doing therapy work. * Several wonderful hunting companions. * Eleven dogs that have obtained their Certificates of Conformation Assessment (CCA) from the Golden Retriever Club of America. * Four dogs that have CPE Agility titles. * Two dogs that have qualified in NADAC, with one having several Outstanding Novice titles. * Three dogs that have USDAA Novice Agility titles and two that have Level 2 titles. * All are well-loved family members. These pups helped Abbi become an Outstanding Dam, as bestowed from the Golden Retriever Club of America and Chime's pups are helping her get her OD title soon too. We now have our second generation pups from our breeding program. Chime had two litters, the Gemstone and Outer Space Litters. 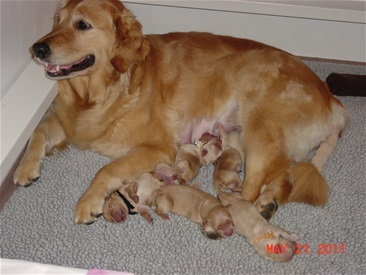 Karli had her first litter in 2014, the Liquor Litter. Bonny had her first litter in the fall of 2014, the Road Litter. Longevity, Temperament, Conformation, and Working Ability are the criterias we use to select stud dogs for our breeding program. Together, with Gayle, we pick sires that we think will combine with our girls to strengthen and solidify type and working ability. Has a lovely, correct head with a pleasant expression, who moves like an athlete. Has a moderate, drip-dry golden colored coat. Is a moderately high energy dog that can hunt birds during the day, but settles well in the house in the evening. Has the natural hunting abilities, biddability and intelligence to be trained to be a capable hunting dog or be shown in agility or obedience by their experienced owner. Loves the family's children and tolerates dog-appropriate handling by them. Gets along well with other dogs. Is healthy and sound, with no chronic illnesses of any kind, including allergies, hot spots and orthopedic problems. Lives a long and healthy life as a beloved member of their family. All of this means that our dogs fit well into active homes where they will have serious jobs and regular training and exercise. 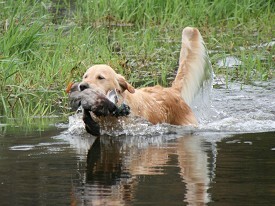 We seek hunting or competition performance homes for the vast majority of our puppies. A few pups each year may go to non-working pet homes, but they will need regular, active exercise. They will not be couch potatoes! 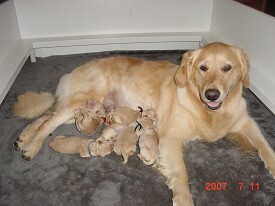 Abbi and all eleven of her 3 day old pups from the Topmast Traveling litter born Jan 26, 2009. * We have a Written Warranty and Sales Contract for all puppies. *We are dedicated to maintaining the multi-purpose golden retriever. *We are breeding for health, temperament, natural working ability, & type. *We produce Competition & companion puppies available to approved homes only. *All breeding stock is cleared for hip, elbow, eye and heart diseases. *All puppies are raised in our home to ensure their development includes the sounds and smells of a typical home and regular interaction with people. * They have free access to their dam until the puppies go home. * They are fed Bravo brand raw diet starting at 5-6 weeks. * They will have one set of vaccinations, based on the titer of their dam to determine when it is optimal for them to get their vaccine. * They will have Innova Adult Kibble for training treats. * They will see their regular vet and get their first vaccine and be micro-chipped. They will be examined by a cardiologist and opthomologist for heart and eye screenings before leaving for their new homes. * We do NOT remove dew claws since we believe these toes play an important role in turning and hill descents for active dogs. * They will be assessed for conformation structure and type. * They will be assessed for temperament and working ability, using a modified version of Sheila Booth's "Positive Puppy Preview". * They will be tested for birdiness before we send them to their new homes. All of our efforts focus on making each pup the best that it can possibly be, and then matching them up to the best owners for each pup's capabilities. Our goal is to carefully place each pup with a well-suited family, ideally, in a hunting or competition home. Our commitment to producing healthy pups demands that we collect genetic information from all pups of our breeding. For this reason, we require that all of our pups be tested for genetic diseases at 24 months of age, at the owner's expense. This testing provides important health information both to their owners and us, and includes OFA hip and elbow x-rays, an eye exam by a certified veterinary ophthamologist, and a heart exam by a board certified cardiologist. Depending upon where you live, these tests should cost under $600. We expect to stay in contact with you for the life of your puppy and we encourage our puppy owners to join our Yahoo Groups website and keep each other up to date on the latest happenings of your pups.